England's most famous 18th century composer. While Handel himself did not write much of the text used for libretti to his operas or oratorios, but often collaborated with a librettist. He was, however, often active in revising the texts while he set them to music. 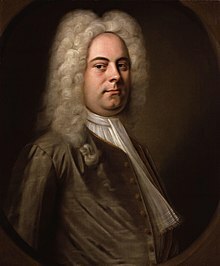 Among others, Handel has used libretti by Charles Jennens, Samuel Humphreys, Rev. James Miller, Thomas Morell, Thomas Broughton, and Newburgh Hamilton. "Handel, George Frederick," in Dictionary of National Biography, London: Smith, Elder, & Co., (1885–1900) in 63 vols. This page was last edited on 25 November 2018, at 15:46.